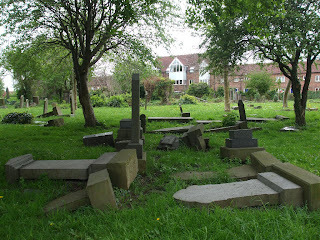 The Westgate Hill Cemetery Company was established in 1825 in order to raise £3500 in shares to build a cemetery open 'to the whole human family without difference and distinction'. 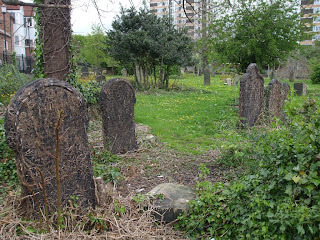 ('A Fine and Private Place', 2000, Alan Morgan, p7) The cemetery itself (also known as Arthur's hill) was designed by John and Benjamin Green and built in 1829 and consisted of three acres of unconsecrated ground situated opposite the earlier graveyard of St. Paul's Chapel. 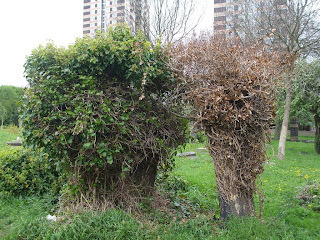 The now unused cemetery has been overgrown and in a terrible state for some time now with countless graves smashed up and daubed with graffiti. I've had my eye on this place for a while now but was always frightened away from photographing it by large groups of alcoholics who frequent the place most day times. Check the video below for more on that subject. 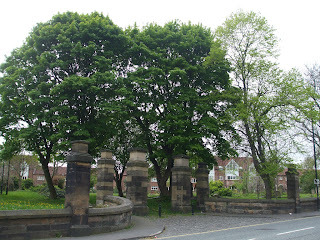 Some of the description came from The Landscape Design of the Cemeteries in Newcastle upon Tyne which has more information on the cemetery. Thanks to The Northumbrian Association and Tyneside Grave Matters we know some of the deceased who are buried in the cemetery. 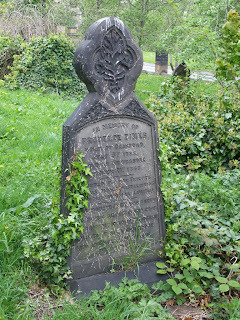 Robert Hood Haggie, who founded the rope works. James Crozier, an eccentric pharmacist who slept on the floor of his Clayton Street shop, lived on rice and tea and wore a white cotton suit night and day. Thomas Telford City Councillor, Brush Manufacturer. Born 1819. 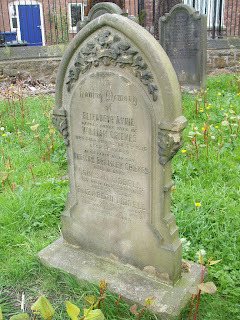 Died in Newcastle on the 16th July 1893. Jane Richardson (nee Wigham) b.19th March 1808.In the 1830s she lived at 6 Summerhill Grove, in Westgate, St John's parish, Newcastle. She was recorded there with her husband, six children, and four servants, in the 1841. census. d.5th Dec 1873. Bur. 8th Dec 1873. Edward Richardson b. 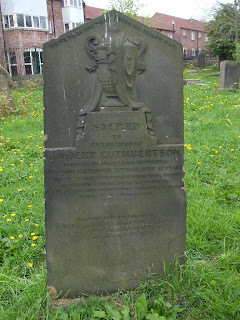 (Husband of the above)12th January 1806, in St John's parish, Newcastle. In April 1826, with John Richardson, Edward was one of the founding twelve members of the Newcastle Book Society. He joined the Newcastle Lit. & Phil. in 1828. Thomas Spens. Lithographer. 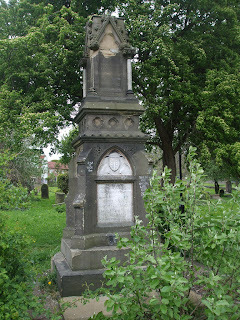 He died on 24 Sep 1875 in St. Andrews, Newcastle. 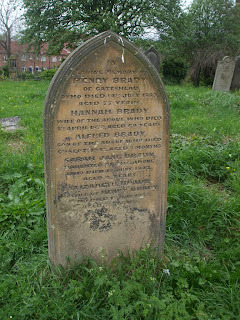 He was buried on 28 Sep 1875. Esther Harrison (wife of the above). 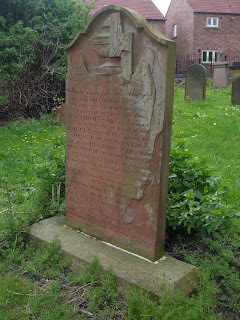 She died on 22 May 1889 in Micklegate, York, She was buried on 25 May 1889 She married Thomas Spens lithographer on 8 Jan 1838 in St. Andrews, Newcastle on Tyne. John James Spens (son of the above) was born on 22 Apr 1839 in Cannon Street, Gateshead, He died on 27 Nov 1839 in Cannon Street, Gateshead. He was buried on 29 Nov 1839. 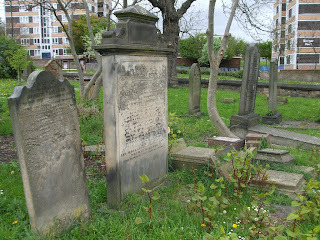 John James's name on family headstone in Westgate Hill Cemetery, buried Ward Q. No. 54, depth 5 feet, died of hives. William Mitford was born in Preston Near North Shields, April 10, 1788. An important songwriter. 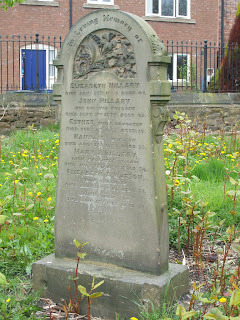 Parents died when a child brought to Newcastle by an uncle atage 3-4 years. Apprenticed to shoemaker in Dean street possibly to the father of Willie Armstrong. The Budget or Newcastle Songster was published in 1816 by Marshall, in the Cloth Market. This work contained 11 songs. Mitford is known for: Cappy, The Pitman's Courtship and X.Y. Mitford played the part of the bishop in the coronation held on the festival of St. Crispon by the Cordwainers July 29, 1823 at the Freeman's Hospital, Westgate. 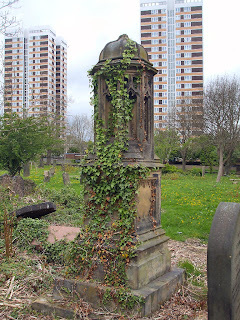 A story, in the Evening Chronicle in November 1984, showed grave robbers had plundered family crypts which had lain undisturbed for more than 130 years. The story became even more gruesome when they traced the crime to a group of men calling themselves the Gentlemen Of The Club, otherwise known as a weird pop group called Metgumbnerbone, who specialised in Tibetan trumpet music. These young men had used the bones they had taken from the crypts to make musical instruments by drilling small holes in them. When police raided the home of one of the men in Northcote Street, Newcastle, they found a welcoming sign above the door - an imitation axe and the Metgumbnerbone emblem of a skull. Inside the house they found several bones lying around the living room, thigh bones and skulls on the kitchen table and bags of skulls waiting for attention. There were also books on sexual deviation and black magic, as well as other aspects of the occult. Hanging on the living room wall was the black magic symbol of inverted triangles in a circle. A huge flag covered one wall with its gold on black emblem. When the five men were arrested they admitted attacking three graves and removing skeletons. Altogether there were 10 bodies of men, women and children. The group also kept a manuscript of their dark deeds. They told how on a midnight raid at the Westgate Hill Cemetery in Newcastle they smashed crypts and entered the vaults where complete families lay at rest, their bones incased and neatly stored. Using shovels and torches they dug their way underground, risking becoming trapped under the ancient stone and marble. A CID spokesman said the case was a sickening misuse of the sanctity of the dead. From their inquiries detectives were left in no doubt that the club members had been indulging in ritualistic rights of the black arts. 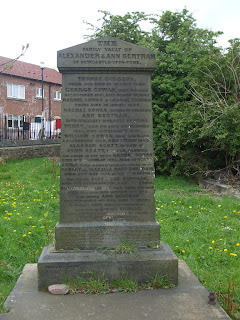 The five musicians, Alan English, of Jesmond, John Smith, of Hartlepool, John Mylotte, of Newcastle, Sean Dower, of Benwell, and David Stewart, of Swalwell, were charged with robbing graves and causing damage in Newcastle's Westgate Hill Cemetery. Mylotte admitted three counts of digging open graves and removing the contents. Stewart admitted two similar charges, as did English. Smith and Dover admitted a joint charge of opening a grave and Mylotte admitted stealing a brass grave plaque. 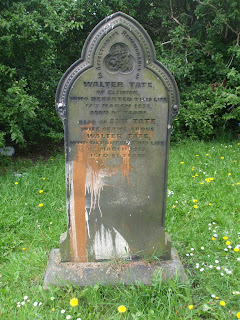 And Mylotte, Stewart and English admitted damaging property belonging to Newcastle City Council. Sentencing Mylotte, Stewart and English, Judge Myrella Cohen said was satisfied occult practices were behind their sinister activities. Stewart and English were given 12 months' jail and Mylotte, described by Judge Cohen as the "lynch pin" behind the offences, 18 months. Dower and Smith, both students, were said to be the least involved. Smith was given 160 hours' community service and Dower, who was at Newcastle University, 100 hours. The members of the Metgumbnerbone group, also calling themselves the Gentlemen Of The Club, documented their deeds in manuscripts, which read: "It was not a long walk to our goal. And once there we speculated as to where at first we should strike. "On what piece of ground should we first lift the spade to the earth. Name, sir, which grave that man has made to incarcerate. "Christian, in undisturbed rest, sent in tomb to lie in peace, inviolate, shall we in turn violate? 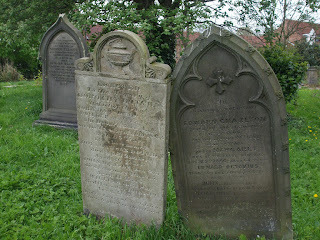 "Our destination, which you will perceive, was to the cemetery given into the parish of Elswick. "Here we did find our first objective. A crypt belonging to a family. "It had been much labour to shift the uppermost piece of brickwork upon which the grave slab rested. "They had lain unmolested for 130 years ..."
A video shot in Westgate Hill cemetery by YouTube user Stickings90. This Link does not work any longer. Thanks for your site though! 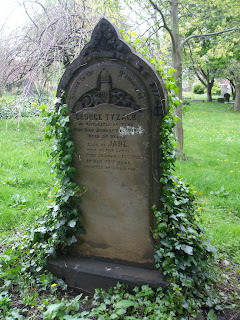 "Thanks to Interesting Burials in Newcastle... "
Thanks. That page seems to have gone now but the site is till alive. I will change the link. Thanks for the interesting story and photos. I was in the cemetery today. I didn't have any problems with drunks or anything but this was probably due to the fact that the whole area is so incredibly overgrown, once you got off the main pathway you had to wade through the grass and foliage. It is actually hard to make out most of the gravestones now. The condition of the place is pretty sad but with all of the cuts going on at the moment I can't see that changing in the near future unfortunately. Thanks. It's been a while since I have been up there so I must be due another visit sometime soon. I took a wander here today to play with a new camera and take some photos since I live opposite now. Came across this post. Looks like it has degenerated even further since your visit. Shame nothing was done! If you post any of the photos you took online let me know and I put link to them from here.